How Your Sleep Affects Your Skincare – Getting a good night’s sleep is an often-overlooked part of your skincare routine. You can use the best products, the latest techniques, and do everything else right, only to have all that hard work undone by not getting enough sleep. Have you ever realized that when you get a poor night’s sleep your skin looks and feels less clean and bright? There are reasons why they call it “beauty sleep” — here are some of them. Lets see in detail how your sleep affects your skin care below. When you do not get enough sleep on a regular basis, you put an incredible amount of stress on your brain and your body. The chemicals and hormones caused by stress, such as cortisol, can cause your skin to become inflamed. The inflammation can also cause your skin to get itchy, which can worsen your quality of sleep — this vicious cycle makes getting a good night’s sleep a major priority. There is also a negative cumulative effect to skin inflammation. When it gets more inflamed, your skin is less able to defend itself against external threats — dirt, debris, airborne chemicals, allergens, UV radiation from sunlight, and so on. More importantly, inflammation is one of the single biggest factors in causing a breakout of various skin conditions such as acne, allergies, psoriasis, rosacea, and so on. If you are prone to any such skin condition, it is more important for you than most other people to make sure you get a good night’s sleep. Another issue with a lack of good sleep is the damage it causes to the systems in your body that help your skin look naturally beautiful. The worse you sleep, the more the collagen and hyaluronic acid levels in your body break down due to stress on your skin and its cells. These are two crucial components of your skin’s biology that maintain your skin’s tautness, brightness, and overall healthy appearance. You can really notice the difference when you have a prolonged period of poor sleep followed by finally getting good sleep again. Your skin goes from looking like you’re a walking zombie with loose, saggy, wrinkled skin, to a noticeably more bright, smooth and youthful complexion once you get a good sleep — even without using any skincare products. With poor sleep, you also get less blood flow to your skin, especially the skin in your face. You lose a lot of your skin’s natural color, and also compound the inflamed, sagging and puffy eyes — dark under-eye circles are a common symptom of poor sleep. One of the main ways that getting a good night’s sleep can help with your skincare is because sleep is when your skin and body achieve the proper balance. While you sleep, your body restores its hydration levels and your skin recovers moisture lost during the day. Sleep re-hydrates your skin, which is, as you’ll know from all the moisturizing products you use, a major factor in any skincare routine. As you lose hydration in your skin, it affects your pH levels that balance the acid to alkaline ratio in your skin. When you have too much alkaline, your skin gets dry and more sensitive to debris, sunlight, and so on. When you have too much acid, your skin is more prone to large breakouts of acne. It also affects how bright and young your skin looks. That’s one of the reasons why most effective skincare routines involve using products and habits before you go to bed that will help preserve your skin’s hydration. Without them — and without good quality sleep — you’ll notice that when you wake up your skin looks dry, lifeless, and red. In addition to helping balance your hydration levels, getting a good night’s sleep also helps your body recover. New cells grow to replace dead or damaged skin cells when you achieve a deep sleep. In order to get the right amount of recovery, you need to sustain that deep sleep for a minimum amount of time — how much depends on your age and genetics, but in general 7-8 hours is the ideal amount. So instead of having loose, inflamed, dehydrated, and wrinkled skin, with the right amount of sleep your skin will look tighter, smoother, brighter, and healthier. We’ve already mentioned how your collagen production slows down when you don’t get good sleep. Collagen is an important protein that helps your skin heal itself naturally when you get a cut, bruise, or burn. Poor sleep also decreases important growth hormones that helps your body produce new, healthy, and strong skin cells to replace those that are old or damaged during the day. These hormones are released mostly during deep sleep, so it’s not just a matter of how long you sleep but the quality of restful sleep you receive. There has long been a known link between the food you eat and the health of your skin. What you probably didn’t know was that there is also a link between being sleep-deprived and having poor dietary habits. When you don’t get enough sleep, your body produces more of two hormones. The first one is ghrelin, a hormone that helps remind you when you’re hungry. The second is leptin, a hormone that tells you when you’re full so you stop eating. 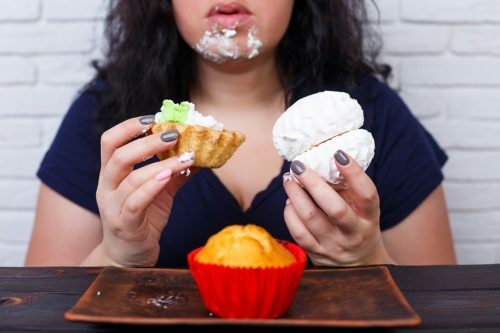 That’s all bad enough, but when you combine that with a study that shows how people tend to crave and eat more junk food when they’re sleep-deprived, you have a recipe for skin disaster. When you don’t sleep well you feel more hungry, you have a harder time telling when you’re full, and you’re more likely to eat more junk food. Combine that with how junk food increases the chances that you get skin problems like acne, and it’s just another good reason to make sure you get your beauty sleep. Another problem is how sleep deprivation can mess with your body’s ability to handle and digest insulin. When you sleep poorly, the cells in your body that would normally burn fat and sugar for energy lose productivity, thanks to your metabolism slowing down. Your body does this, thinking that you’re not sleeping due to danger and so it stores more energy sources, such as sugar, rather than burning it. This messes with your sugar and insulin levels in your system. There have been studies that show a strong connection between insulin and acne, for example, specifically that having insulin resistance increases the likelihood of contracting acne. When your insulin levels spike, you produce more sebum, an oil that blocks your pores. The more insulin in your system, the more sebum you produce, and the more oily and blocked your skin becomes, the more chance you have of developing acne. Lastly, when you are sleep deprived, you are more prone to feeling stressed due to any circumstances in your life. When you feel more stressed, your body produces more cortisol and serotonin, two hormones that make you feel more hungry and make you seek out anything to help alleviate your stress. What happens when we want to de-stress? We crave comfort food. Remember, a lack of sleep cause leptin and ghrelin hormone production to increase, which causes the same sort problems as cortisol and serotonin. Not getting enough sleep causes a vicious cycle where you feel stressed so you eat more junk food, but that causes your skin’s health to worsen, which makes you feel more stressed so you have a harder time sleeping, which makes you feel more stressed… well, you get the point. Though you can use lot of products to take care of your skin, remember if you are not getting enough sleep, that affects your skin drastically. Now you know how your sleep affects your skin. So get enough sleep and make your skin glowing forever. This is a guest post, courtesy of Dr. Craig Crippen from DermMedica. Born and raised in Ottawa Ontario, Dr Crippen has attended three Canadian Universities and obtained four educational titles including his Doctor of Medicine (M.D.). Dr Crippen has devoted his practice exclusively to both medical & cosmetic skin care procedures/treatments at his clinic.